Your bathroom is one of the most frequently-used spaces in your home, and as a result it can begin to accumulate small items and toiletries that can make it feel cramped. If your washroom is in serious need of some organization, there are plenty of bathroom accessories that can turn the room into a streamlined space. The walls in your bathroom are filled with untapped potential, so consider incorporating a medicine cabinet or a few floating wall shelves. This can create storage space out of thin air and it can provide a wonderful spot to display a few decorative accents. Better Homes and Gardens recommends looking into drawer organizers that can fit into the spaces in your bathroom vanity. These can hold everything from soaps, bath gels and shampoos or you can use them to keep your jewelry and other accessories in a safe place. There's nothing worse than walking into a cluttered bathroom in the morning, but you can completely revitalize the look of your washroom in under a weekend. 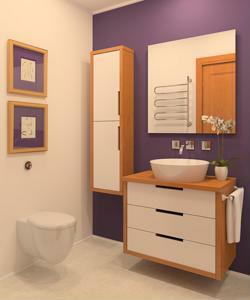 What organizational tips do you have for a cluttered bathroom?